Metabolism of Rhodococcus has evolved for adapting to a wide range of nutritional conditions. This adaptation often involves the flexibility of the central metabolism, which usually provides energy and precursors for biosynthesis processes, either during growth or during non-replicative metabolically active periods. The pathways of central metabolism are almost identical across widely divergent organisms, which share essentially the same metabolic network. However, this network possesses species-specific components, which depends on the biology of rhodococci. 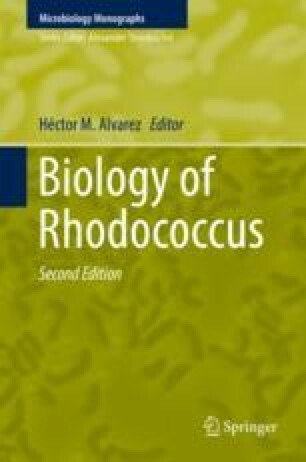 The central metabolism of members of Rhodococcus genus in the context of their physiology is the main topic of this chapter. An overview of main pathways of the central metabolism and their link with other metabolic processes is given. Glycolytic pathways, gluconeogenesis, phosphoenolpyruvate-pyruvate-oxaloacetate node, tricarboxylic acid cycle (TCA), glyoxylate pathway, and some lithoautotrophic pathways are included.